Trained in the Fear of God began so well I was reading it with a highlighter. I was excited by statements like: “Christian households and churches are not shelters from the conflict; they are gospel-empowered training bases for the conflict” (14); such a strong case was made for the importance of family ministry that I was excited to learn how to apply it within our household and congregation. Unfortunately, I really felt the book fell short of it’s introduction. It was “okay” and certainly informative, but it didn’t engage me or offer anything new or exciting to make seeking out this particular book worthwhile. Actually, I found the tone of the writing to be negative in several places, rather than encouraging and edifying to the body at large. Structurally, this book is actually a collection of shorter, academically written, articles arranged into three topical sections: 1) the theological basis of family/church structure (especially in regard to gender roles), 2) the historical views of family discipleship within church history, and 3) the practical application of bringing a strong spiritual tradition into our homes. The articles themselves are completely independent from each other and written from a variety of authors. I read each article with various degrees of interest and enjoyment. A few of the articles I really enjoyed, many I found informative but didn’t personally connect with, and many others I just really didn’t like for various reasons. The advantage of this structure is that it can be read in any order or amount and used as a reference book. However, this is a surprisingly small book to be an anthology, and most of the articles were not very thorough, so in general I felt the structure hindered the message of the text. I think it would have been more powerful for the authors to focus in on the most important issues (say, the biblical framework of family ministry) and to write cohesive chapters with a climatic build of information and a direct application of the principles being taught. I felt instead that the book was trying to cover too much with little success. I also want to mention that the book focuses heavily on the family and church being led by men and supported by women as a definite secondary role. I actually do agree that men and women are created distinctly, with unique purposes. But the emphasis, I felt, was inappropriately exaggerated as there is much more depth and beauty to how God created us than what I felt this text implied. Just as there is both a distinction and a unity between Jewish and Gentile believers, so is there an appropriate balance between the roles and partnership of male and female believers. 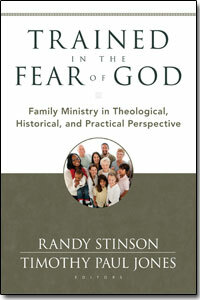 The upset of how this balance was described in this book really hinders the message of family ministry, and, despite its intention to reinstate a positive family structure, was discouraging to that mission.